"This is a very timely book. With the recapitalization and reform of China's banking sector now well under way, the banks are on the brink of a new era of growth and expansion. This work is the definitive reference on the banking sector in China, and is an essential tool for anyone seeking to understand the dynamics of financial intermediation on the Mainland. It sets out the facts, free of the judgment calls that so often cloud the true picture of the health of China's banking system." "As China continues its impressive pace of economic growth, the rest of the world is constantly reassessing the opportunities and challenges it presents. 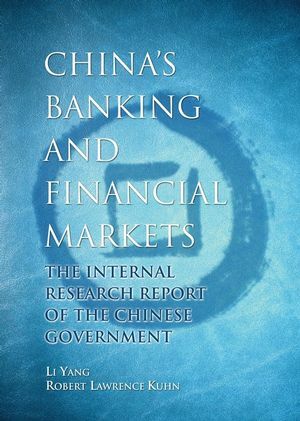 This book is the first official report on the status of China's financial services industry and financial markets. For the first time, the international community gets access to the same information that the Chinese government uses in making key policies. Such unique insights make this book an essential read for business leaders, investors, policy makers, scholars, and anyone who is interested in understanding China's profound impact on businesses and consumers globally." --Maurice R. Greenberg, Chairman & CEO, C.V. Starr & Co.
"This is the first book that introduces all aspects of the Chinese banking and financial markets to international audiences. From its developmental history to its contemporary challenges, China's banking and finance markets are presented, explored and analyzed with great detail and in great depth. Both the richness of the data and the scholarly strength of the methodology are a milestone. China's increasing participation in global financial markets makes this book a must read for all financial professionals worldwide." Dr. Robert Lawrence Kuhn is an international investment banker and corporate strategist. Since 1989, he has been advising the Chinese government on economic policy, mergers and acquisitions, science and technology, media and culture, and international communications. The author or editor of over 25 books, including The Library of Investment Banking, Dr. Kuhn wrote The Man Who Changed China: The Life and Legacy of Jiang Zemin, a precedent-setting biography of a living Chinese leader that was China's best-selling book of 2005. Dr. Kuhn is Senior Advisor to Citigroup Investment Banking and Senior Partner of IMG, the world's premier sports, entertainment and media company. A public intellectual with a doctorate in anatomy/brain research (UCLA) and a master's in management (MIT), Dr. Kuhn speaks and writes frequently in the business media. Part I. Macro-economy and Policies. 2. Financial Industry Performance and Monetary Policy Operation. Appendix to Part I — An Analysis of China’s Fund Flow in 2004. Appendix I to Part II — Asset-management Companies in China. Appendix II to Part II — China’s First Money-broking Company. Appendix III to Part II — The National Council for Social Security Fund. 7. The Inter-bank Money Market. 8. The Inter-bank Bond Market. 9. The Stock Exchange Market. Part IV. Balance of Payments and Exchange Rate. 12. The Balance of Payments and Reform of the RMB Exchange Rate. Part V. Legal and Institutional Environment for Financial Development. 13. Building a Rule-of-law Environment in the Financial Industry. 14. Regional Differences in Asset Quality and Financial Ecology.